Soon after the discovery of 1I on October 24, a wild race began between astronomers from all around the globe, and my team and I participated in order to obtain telescope data and study I1. Within two days, my fellow researchers and I obtained director’s discretionary time on the Apache Point 3.5 m telescope in Sunspot, New Mexico and obtained images of the asteroid as it passed through the desert skies. Asteroids have been observed indirectly around other stars, but this was the first opportunity to study a piece from another solar system while it still was in the confines of ours at an unprecedented level of detail. 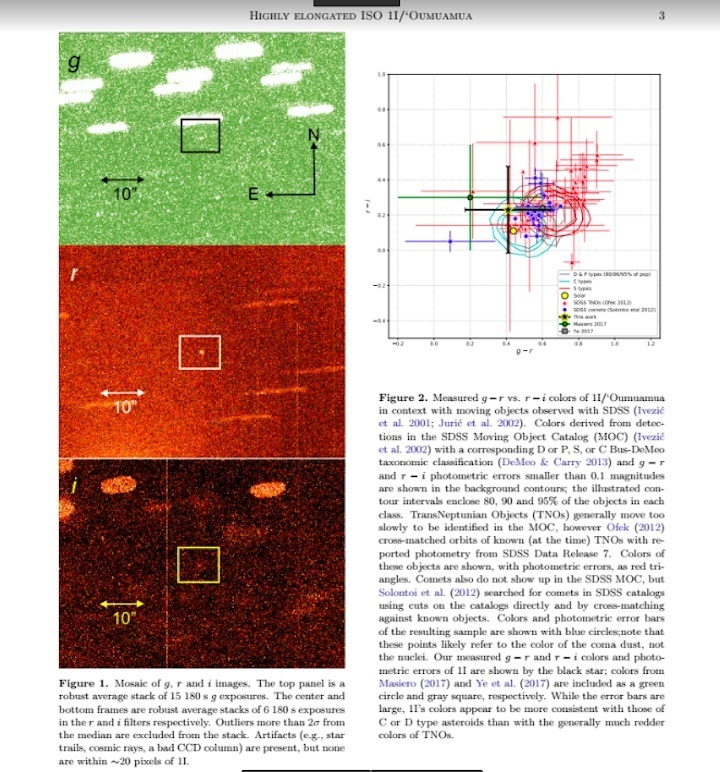 Photometric colors and spectra telling the chemical composition of the surface of 1I were taken, and study revealed that it has a reddish color and probably came from the inner part of its original system where its host star’s heat played an important role in the formation of asteroids and planets. Additionally, the object’s rotation was studied revealing that the object was shaped like a skinny potato. Below is an image of the object as it crosses the sky and a picture of an asteroid with a similar shape to 1I. There is also a video demonstrating what 1I/’Oumuamua would look like spinning in space. It’s thought that objects that are elongated have plasticity and are shaped, stretched, and elongated when they encounter the gravity of a planet during a close approach. Does this imply that 1I experienced a gravitationally stretching event before it was ejected from its solar system? Time can only tell as we gather more data. Stay tuned! My team and I have submitted our observations to The Astrophysical Journal Letters for publication of our results. Russian billionaire Yuri Milner says if the space rock 'Oumuamua is giving off radio signals, his team will be able to detect them—and they may get the results within days. The email about “a most peculiar object” in the solar system arrived in Yuri Milner’s inbox last week. Milner, the Russian billionaire behind Breakthrough Listen, a $100 million search for intelligent extraterrestrial life, had already heard about the peculiar object. ‘Oumuamua barreled into view in October, the first interstellar objectseen in our solar system. A day later, Milner’s assistant summoned Loeb to Milner’s home in Palo Alto. 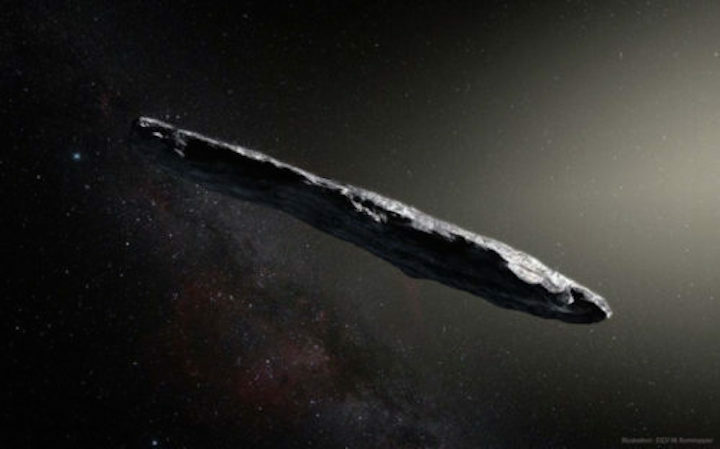 They met there this past Saturday to talk about ‘Oumuamua, a Hawaiian word for “messenger.” Loeb ran through the space rock’s peculiarities, particularly its elongated shape, which looks like a cigar or needle—an odd shape for a common space rock. The new observations will likely be welcomed by the many astronomers who have been scratching their heads for weeks over this space rock. ‘Oumuamua seems to smash many of their predictions about fast-moving interstellar objects, and the more scientists delve into the data, the more puzzles they find. The glint of ‘Oumuamua was first spotted by the Pan-STARRS survey telescope in Hawaii during its nightly scan of near-Earth objects like comets and asteroids. Its speed and orbit suggested the object was not bound by the sun’s gravity, and was not of this solar system. At first, astronomers thought ‘Oumuamua must be a comet, based on decades of scientific literature that predicted its arrival. When our solar system was young, the biggest planets wreaked havoc as they swirled into shape and settled into their orbits. Their movements could jostle nearby material so violently that bits of rock and ice would go flying way out into the universe. The easiest objects to eject were those orbiting at the edge of the solar system, where escaping from the sun’s gravity would be easier. In our solar system, there are far more comets than asteroids lurking near the boundary before interstellar space. Astronomers expected these to be the first interstellar objects they saw. And so astronomers checked ‘Oumuamua for a coma, a tail of evaporated material that trails comets as they pass near the sun and become heated up. They used telescopes that can detect a sugar cube’s worth of material flying off the object every second. But ‘Oumuamua showed no signs of a coma. This was the first surprise of many. Unlike the lumpy, potato-shaped asteroids of our solar system, the 400-meter-long ‘Oumuamua is perhaps 10 times as long as it is wide, an extreme aspect ratio that trumps any of the known asteroids. Astronomers don’t know how the universe could have produced an object such as this. Most natural interactions between an object and its surrounding medium favor the creation of rounded objects, Loeb said, like pebbles on a lakeshore made smooth by lapping water. Further observations of ‘Oumuamua revealed it carried no traces of water ice, which suggests the asteroid is made of rock or perhaps metal. Whatever it is, the material is certainly sturdy. ‘Oumuamua rotates about every seven hours, a rate that would likely cause some rocky objects, nicknamed “rubble piles,” to crumble. ‘Oumuamua even survived a close pass with the sun in September, before it was detected, without breaking apart. Thanks to its nonspherical shape, the asteroid is tumbling uncontrollably. “If you take an object that isn’t round and you throw it up in the air, it’ll make this complicated spinning motion,” said Jason Wright, an astronomer at Penn State University. “It just doesn’t just spin nicely along one axis.” Wright said a long journey across the cosmos can slow an object’s tumbling, but ‘Oumuamua has shown no signs of stopping its spinning. Karen Meech, an astronomer at the University of Hawaii Institute for Astronomy whose team discovered ‘Oumuamua, has said their observations are “entirely consistent with it being a natural object.” Analysis of the light reflected by the asteroid shows ‘Oumuamua is red, a color that would be expected for rocky bodies exposed to the cosmic radiation of interstellar space for long periods of time. There are indeed some natural explanations for some of ‘Oumuamua’s weird properties. Some astronomers say ‘Oumuamua could be a contact binary—two objects that drift closer until they touch and fuse at one end—like our solar system’s Kleopatra, a metallic, dog-bone-shaped asteroid. They suggest any ice on the asteroid’s surface was zapped away by high-energy particles on its journey between stars. Perhaps the asteroid is so hardy because it formed in the inner regions of a solar system, where rock and metal are more commonly found than ice. This would be tricky, since most exoplanets discovered so far orbit extremely close to their parent star, preventing them from flinging debris beyond the star’s pull. But they may have siblings, like our Jupiter and Neptune, lurking in the darkness, doing the work for them. If ‘Oumuamua has anything exciting to tell us, it’s that our understanding of planet formation needs some work, said Gregory Laughlin, an astronomer who studies exoplanets at Yale University.“We know that planetary systems are extremely common, but the way that their process unfolds seems to be richer than anticipated,” he said. The thought of a spaceship being dropped into planetary systems like a reconnaissance mission may sound like the stuff of science fiction. But for Milner, it’s the future. Milner is spending $100 million over 10 years to develop spacecraft technology capable of sending a tiny probe hurtling at one-fifth the speed of light toward Alpha Centauri, the nearest star system to Earth. If Milner succeeds, the 25-trillion-mile trip would be cut from tens of thousands of years, based on our current technology, to a breezy 20 years. Hundreds of these miniature probes would be deployed into the darkness in the hopes that at least one might complete the journey. Perhaps another civilization already had the same idea. If that kind of technology were available today, Milner said he would send some kind of probe after ‘Oumuamua. “We need some new propulsion technologies to be able to do this,” he said. The possibility that ‘Oumuamua is an artificial artifact from an advanced civilization is not spoken in whispers in the astronomy community. But there’s a healthy dose of hesitation in their discussions. Scientists must, after all, exhaust every other plausible explanation before considering ET. “It’s sometimes mentioned in a half-joking way that people say things when they’re not quite sure whether they want you to take them seriously or not,” said Ed Turner, an astrophysicist at Princeton University. He’s intrigued by a potential seti observation of ‘Oumuamua, but, like most astronomers, he’s not holding his breath. “If you were betting your house, I wouldn’t bet it on this,” Turner said. When they speak of ‘Oumuamua, astronomers recall the tale in Arthur C. Clarke’s 1973 novel Rendezvous with Rama. The year is 2131, and astronomers have detected a mysterious object beyond the orbit of Jupiter and classified it as an asteroid. 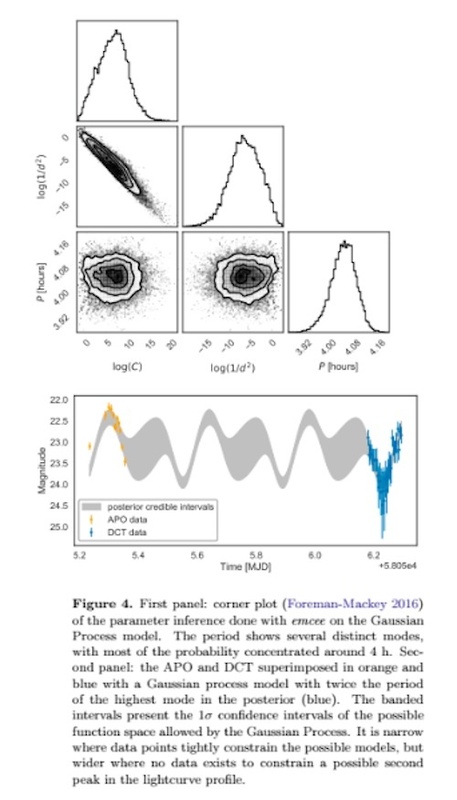 Their observations reveal the object, named Rama, doesn’t follow the orbit of the sun and must have come from outside the solar system. They send a space probe to photograph Rama and find it’s in the shape of a perfect cylinder. A crewed mission is dispatched. When they land, humans discover the asteroid is an alien spaceship, carrying odd, machinelike beings that pay them little attention. There are no signs of the alien civilization that made them. After some tinkering, the human crew disembarks, leaving Rama to speed out of the solar system. The story shares some tantalizing similarities with the current circumstances. The most skeptical astronomers point out that, aside from its vessel-like shape, ‘Oumuamua doesn’t have any of the characteristics one would imagine for an alien spacecraft. The object has followed an easy-to-predict trajectory through the solar system. Astronomers have accurately plotted its course forward and backward. Wouldn’t an alien spaceship travel at a fraction of the speed of light, and wouldn’t it slow down to take a look at things as it swept by? Astronomers predict many more interstellar asteroids, perhaps thousands, are coasting through our solar system, out of view of our telescopes. Pan-STARRS, a survey telescope designed to observe the entire visible sky night after night, found ‘Oumuamua after only four years of operation. Turner suspects the discovery—a fairly quick one—is not a case of pure luck, but a sign of more to come. 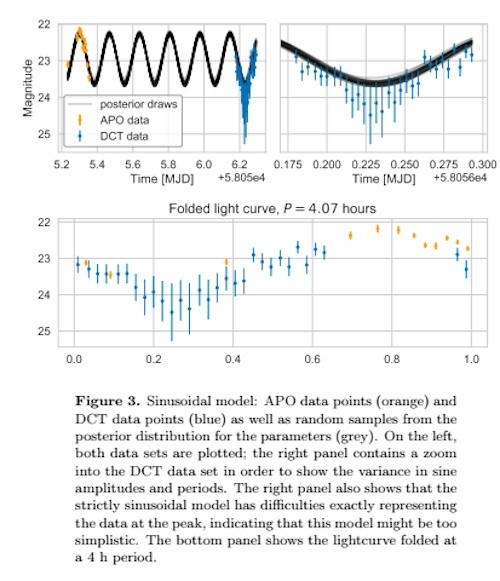 Some interstellar asteroids may be hiding, overlooked, in the archival data of Pan-STARRS. Many more will be spotted as other powerful survey telescopes, like the Large Synoptic Survey Telescope in Chile, come online in the next few years. For Milner, it’s worth examining every interstellar object for signs of artificial technology. They could all be nothing more than space rocks, mindlessly plowing ahead. Or they could be the needle in the haystack. “It would be difficult to work in this field if you thought that every time you looked at something, you weren’t going to succeed,” said Andrew Siemion, the director of the Berkeley setiResearch Center who leads the center’s Breakthrough Listen Initiative. And so, starting Wednesday at 3 p.m. Eastern Time, the Green Bank Telescope will aim at the first known interstellar object in our solar system. The telescope will observe the asteroid for 10 hours across four bands of radio frequency. The results may be made public within a matter of days. Milner knows the odds are against him. But as he spoke from a conference table in his home, flanked by screens filled with radiant telescope images stretching from floor to ceiling, he smiled in excitement. “If you look more, everywhere, I think chances are that eventually you will find something,” he said.